There is quite a clear link between overweight parents and overweight children. Which comes as no surprise, as children learn eating habits from their parents. How often have you seen even toddlers being fed fries at fast food restaurants? However, things go even beyond learned eating habits: Scientists from Boston University now published a study where they found that overweight women often also give birth to already overweight children. Considering that adults who were overweight as children already have a harder time to gain normal weight, as explained in this study, it now seems they were doomed even before they were born. Sometimes life just isn’t fair, is it? It is a hard issue to rule on (whether to enforce it or not), I think we can only go far to educate people that if your baby is overweight get them to play more and exercise, rest well and a clean nutrition. Problem is they [parents] don’t care to do this, even with themselves. It’s almost as bad when you see pregnant moms drink/smoke. But again some babies will be born with diseases and deformities. We’re still bordering on the issue of making it a public ordinance of being morbidly obese. It’s something the government shouldn’t have to remind people, eat right and exercise. Seems embarrassing to remind people of it. It always comes down to the question where our individual responsibility for ourselves ends and where that of society starts. I don’t want to live in a world where people are forced to not drink and smoke or have normal weight, but instead make them understand why it would be important for them. Well, it is often believed that a chubby baby is a healthy baby, so ignorant parents purposely over-feed their babies with the intention of having them gain weight! Yeah, you often have people giving their babies a gallon of milk a day, and making them squat heavy in the hope that they will gain weight. Apparently they succeed quite too often! 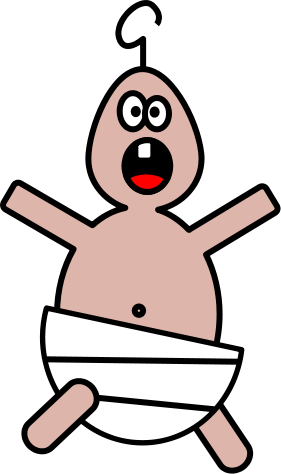 A chubby baby -IS- a healthy baby, and that has been firmly proven, with those that weigh more being less prone to catching infections and generally growing at a steadier rate, as well as faster recovery times when they do come down with something. The term ‘baby fat’ is no myth – and just how an adult dropping bodyfat down to 6% is more likely to have an infection (and what’s more take longer to recover from) than someone with a healthier 10-12%, the same is true with babies. Sometimes it indeed does, doesn’t it? For me this rings too strongly of partitioning blame to factors outside your control. IE – Making excuses. No matter how chubby you are brought into this world, hard work and determination can change that. There are very very few people in the world with genetic conditions that predispose conditions that cause insatiable hunger or fat storage imbalance, and these are the only ones who really are condemned before birth. Oh, I agree, most things can be overcome with enough motivation. But some people do have a worse start than others and especially the behavior we learnt during childhood is difficult to address. Do you have any advice for teaching healthy eating habits to children? I find it is the most difficult time to get them to think about their health (youth being wasted on the young) but ironically it is the most important time for them to learn the habits to carry into adulthood. They so badly want junk food, it is often easier for the parents, and getting them to eat vegetables is difficult. Do you have any advice? Thank you, Mr. Evil, you are very helpful and intelligent. Well, junk food is so popular because it dense in energy and our bodies still think “loads of energy = good food”. Which made sense in times when food was scarce. So, how can you counter this? Children are eager to learn and they learn best when they can participate and mimic. Cook with them – when they prepare their own food, they will have a sense of accomplishment and will also be more positive to the dishes they made themselves. Educating them about the benefits should be an add-on, but not the prime motivator. She took her monkey to the vet, and the vet said that her monkey was going to die at least 10 years too early due to his diet, on a test where a healthy monkey is under 100, hers was over 400 etc. So the doc finds out that the problem is the monkey eating things like pasta (not whole wheat), and says that the monkey needs to go on a strict fruits, vegetables & nuts diet straight away. When they come home and eat dinner, she gives the monkey a helping of pasta first, then a salad! … With lots of dressing on it. And that’s with a flickin’ monkey!!! It’s exactly that “oh but I don’t want to be mean to my baby!”, when they are actually being mean and killing their baby, that’s wrong. The same goes for cats and dogs that are being so overfed they can hardly walk. I think it’s a misguided sense of nurturing and often people who do this will be overweight themselves. Which is logical, I think: Eating gives consolation to many people and they reason that what makes them feel better will do the same to their pets.